The day we came we made sure we had our son in tow too. You see, I knew we would want to order more than 2 sandwiches. I had my eye on a few of them, but didn’t want to order more than we could handle. Like I would ever do that. This food cart has brought food from Philadelphia, but they didn’t just bring cheesesteaks. Nope, they brought all the other good stuff too. As always I started by asking what I should order. I knew we would get the Meatball sub, but you know, just checking to make sure. Erin, one of the owners, was actually outside the cart when we got there. As I asked the question she quickly pipped up and said the Passyunk. I looked at the menu and noticed that that was the Eggplant sandwich. Not a fan! Again, she said that we had to try it. She promised we would love it. Finally, we all agreed. 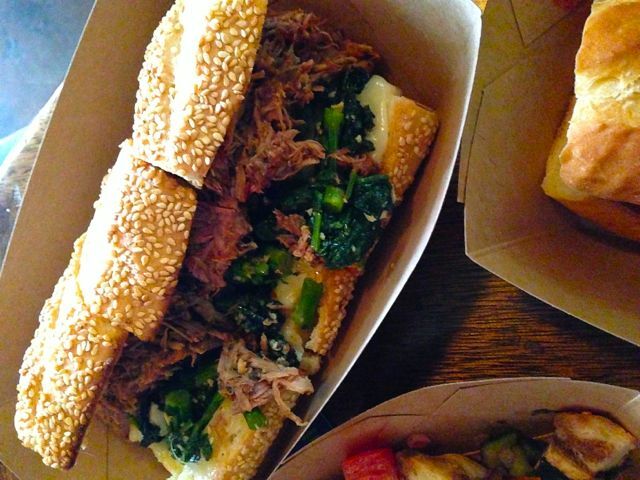 We also love pork so we got the Federal, which is Pork and Broccoli Rabe. As we were almost done ordering the Tasker caught my husbands eye. 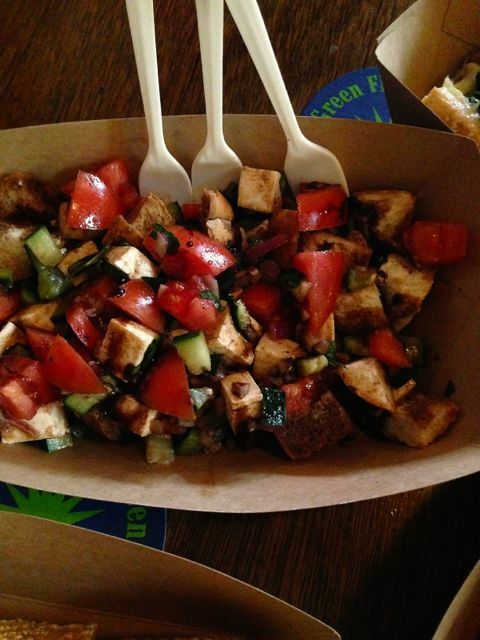 Panzanella Salad with crusty bread, Tomato, Homemade Mozzarella, Fresh Basil, Onion & Cucumber with Olive Oil and Balsamic. After we placed our order we headed inside of Belmont station to check out the beer selections. With such a great selection it’s easy to find a beer. I should also note that kids are allowed in this area until 7pm. (Or at least I think that’s the cutoff.) They have plenty of non alcoholic drinks to choose from too, so we were all set. I should also note that the place was full and we were stuck in the back in a dark corner, sorry about the pics. I loved that they cut all the sandwiches into thirds so we could all share. 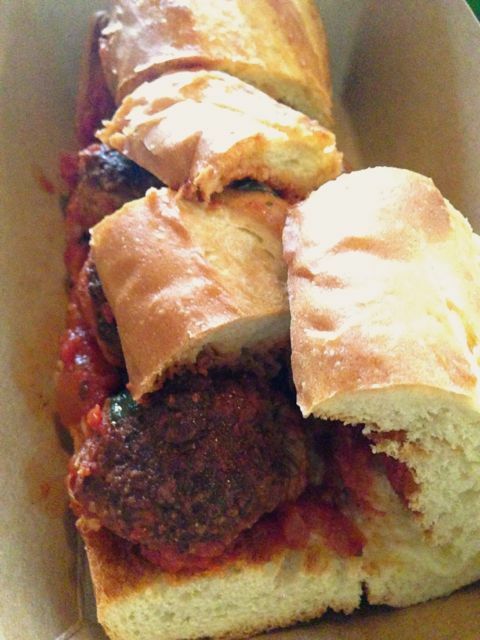 We all tore into the Meatball one since we had heard so much about it, and I am sure I talked it up on the way over. This one was good. I liked the sauce he used and the meatballs were really tasty as well. We saved the Pork for the last because we all love pork so much. 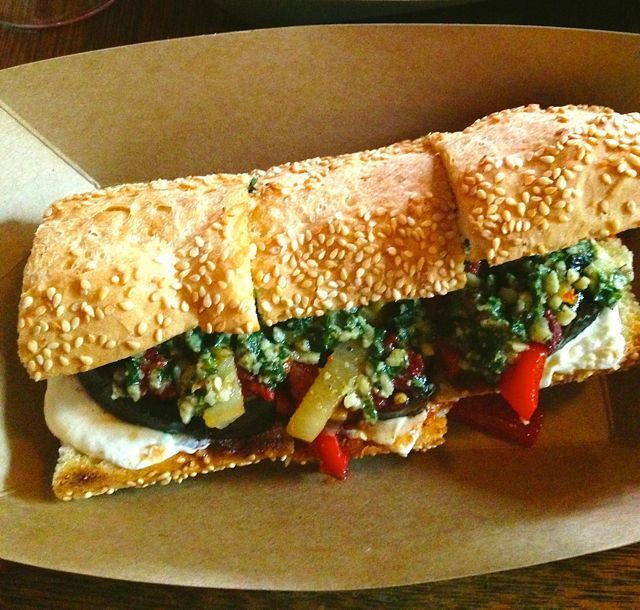 We all dove into the Eggplant sandwich. We all literally stopped and stared at each other. We could not believe how good this was. The Eggplant was cooked perfectly, the flavors were off the charts and the pesto he used was very course giving it a great texture. Favorite sandwich by far. I’m not sure if we were all tainted by the Eggplant or what, but when we bit into the Pork sandwich we were a little let down. I think it was the mistake of competing flavors. It was good and all, but the Passyunk was off the charts amazing. AMAZING!!! I can’t forget the salad. We all enjoyed the salad immensely. We were fighting over the last few bites. It was the perfect balsamic dressing that tied it all together and made it perfect. Atmosphere is a great at this food cart. They have outdoor seating, although it was too cold when we were there, so we wandered into Belmont Station. This is a match made in heaven with these two. 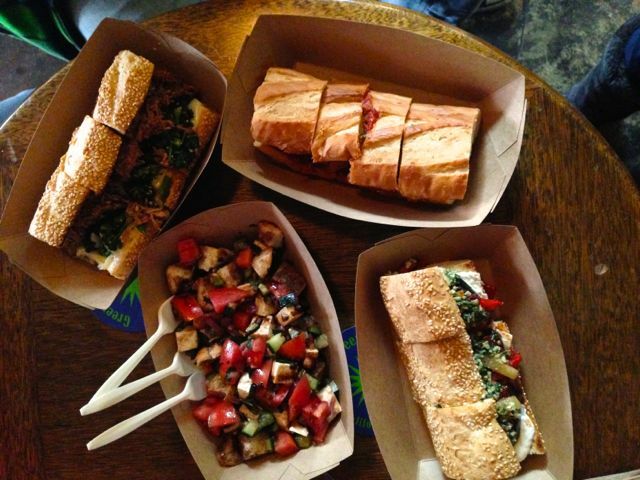 Pricing was $8 for each of our sandwiches. The salad was $5.50. Everything was a really good sized serving, they didn’t skimp at all. Service was great. The obviously steered us in the right direction. They did have a few drinks there, but grab a beer from Belmont Station instead. Italian Market is located at Belmont Station. 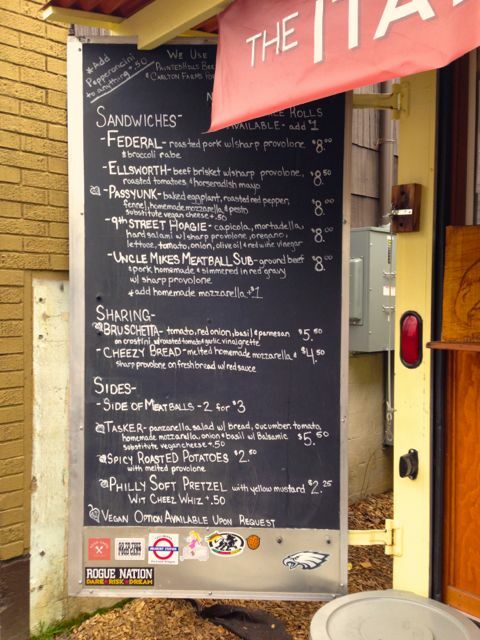 Looking for more Cheap Eats in Portland? Checkout my full list here.